What would the Pebble Mine mean for the communities of the Lake Iliamna region? For the state of Alaska? For the United States of America? More than mere dollars. The villages of the region are shrinking. Lack of opportunity is causing families to give up their traditional homes and move to more urban areas of the state where access to jobs, education and services is more available. It’s understandable—we all want what’s best for our families—but it represents the slow erosion of a way of life that has sustained Alaskans for thousands of years. As generations leave for the cities, unintentionally but unavoidably they also leave behind the languages, customs and practices that define a culture. The Pebble Mine represents an important economic opportunity for the region, and we’re committed to making the most positive local impact we can. Not just during the construction phase, but for the lifetime of the mine and beyond. Pebble promises jobs, and on-the-job-training, to area residents. Good-paying jobs that will help families to remain in their communities and raise-up the next generation of proud, rural Alaskans. Building a mine at the Pebble Deposit means building the region’s infrastructure: port facilities and transportation routes. Locals benefit from these as well, both directly and indirectly—with greater access to the region, the price of goods comes down. Pebble would spur a host of entrepreneurial opportunities, both in-region and out. As a state, we’ve long-relied on the buried wealth of our mineral resources as an economic engine. The Gold Rush brought cheechakos north by the thousand. In recent decades, the oil and gas industry has drawn adventuresome job-seekers farther still, to work the North Slope. If you wanted to work, and were willing to apply yourself, the world was your oyster. For decades, Alaska’s oil fields were responsible for almost one-third of the entire state economy. Today, though, oil production is on the wane. Pebble won’t replace the oil industry, by any stretch. But a thousand jobs are hard to ignore. 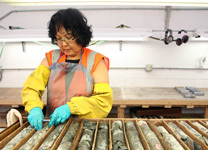 Jobs in Alaska’s mining industry are among the best-paid in the state. Workers earned an average of almost $108,000/year in 2016, more than twice the state average for all sectors of the economy. There are 4,350 direct mining jobs in Alaska and 8,600 total direct and indirect jobs attributed to Alaska’s mining industry with a combined total payroll of $675 million. What’s more, the workforce is 75% Alaska resident, so those dollars stay in the state, benefiting Alaskan families, the Alaskan businesses they shop from, their Alaskan suppliers, and so forth, contributing to our state's economy several times over. In 2016, mining companies paid $81 million in state government-related revenues through rents, royalties, fees, and taxes, $23 million in local government revenue through property taxes and payments in lieu of taxes, and $111 million to Alaska Native corporations. Pebble anticipates employing more than 2,000 full-time workers throughout the mine’s first 20 years of production, as well as thousands of near-term construction jobs. That’s a significant increase to the state’s mining workforce—a thousand careers built. And with a commitment to education, on-the-job training and mentorship, we hope to help create the next generation of Alaska miners. America relies on minerals—we’re one of the world’s largest mineral consumers, and historically, we’ve been one of its greatest producers, too. U.S. mining directly and indirectly generated nearly 1.7 million full-time and part-time jobs in 2015. Labor income associated with U.S. mining exceeded $100 billion in 2015, which includes wages and salaries, other employee benefits and owner-operator business (proprietors’) income. In Alaska, they’re among the best-paid jobs going. We’re coasting, though… investment in exploration is down, so fewer new resources are being developed. We import more and more of our mineral needs—almost half, in fact—to the point where we import all of some commodities that we used to mine domestically. As you’ve seen, nearly 50% of our copper is imported, and it’s an integral part of our modern lives. Did you know the average 747 airplane needs 135 miles of copper wire? That’s greater than the driving distance between Los Angeles and San Diego, or between Anchorage and Seward!